I use a traditional resist-dyeing process of pattern making, known in Japan as shibori. This traditional shibori is combined with contemporary design and influences such as the colours and patterns of African textiles. Barbara Rogers is a textile designer, based in Sydney, with over 20 years experience in textile design and fashion. She has developed unique contemporary methods from Japanese techniques for dyeing and surface design; In particular shibori techniques using a range of dyes produce unique visual effects on fabrics and leathers. She has also incorporated various printmaking methods such as linocuts, wood blocks and photography into her work as well as utilising sewing and stitching. 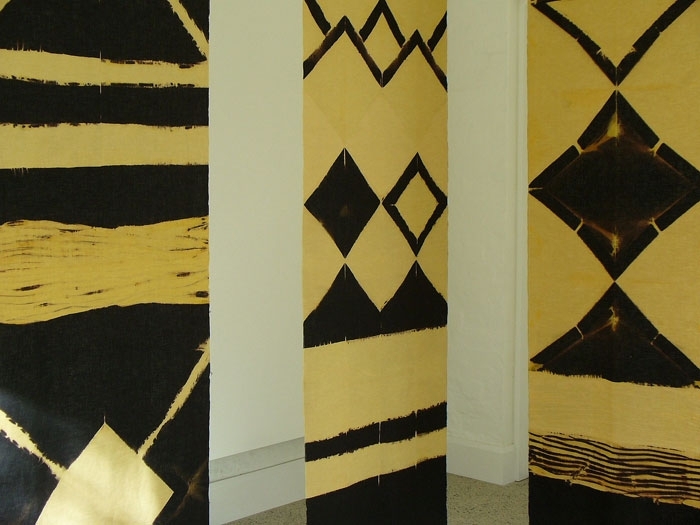 Her work draws much of its inspiration from Japanese shibori techniques; twentieth and twenty first century western textiles as well as design from historical and contemporary African textiles. Rogers has exhibited nationally and internationally. In 2005 Rogers was invited to exhibit in ARTWEAR Fashion and Anti-fashion at the Fine Arts Museum of San Francisco, accompanied by a full colour catalogue. She was the inaugural winner of the Dame Mary Durack Contemporary Award in Leather and her work is represented in Yoshiko Wada’s Memory on cloth – shibori now, 2002, the definitive publication on contemporary international work in shibori, as well as the recently published Fibrearts Design Book 7. In 2004, Barbara Rogers initiated an exhibition Marks and Memory -contemporary artists respond to the traditions of Japanese shibori textiles, at Fairfield City Museum and Gallery, Sydney. The exhibition involved four textile artists, each working in a different medium, and four other artists who work with metals, clay, paper, inks and light-sensitive solutions. Each artist was asked to consider the potential offered by shibori within his or her chosen materials and field of expertise.